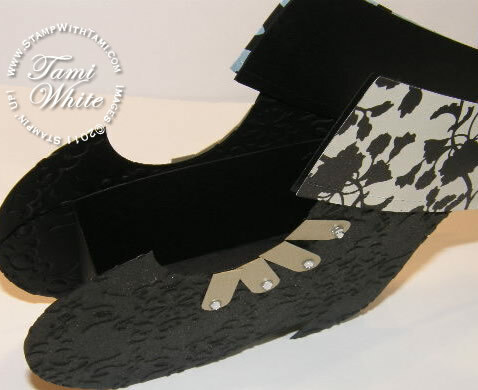 Soooo stinkin’ cute, this Witch Boot Treat Box goodie holder is just to die for!! Perfect for Halloween. Inspired by the Dynamic Duo Susan Adams & Janet Baker (see theirs below). This witch is stylin’. Just insert candy into this fun box and you’ll be the hit of every Halloween party. Check out the video below and see how easy this fantastic project is. Change it up, make it white and use it for wedding favors and more! To the right is another version of the box that Susan & Janet designed. 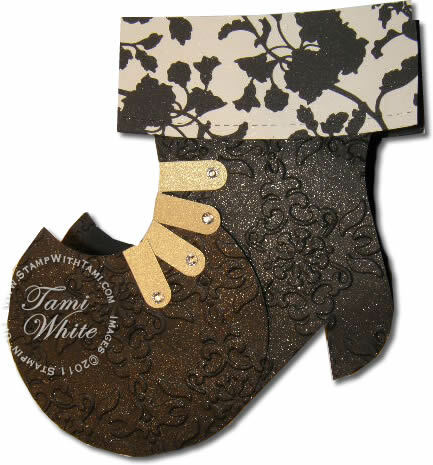 Their witches boot uses the Mocha Morning Specialty paper (122366), and Silver Glimmer Paper (124117), instead of spritzing the shimmer paint we dabbed it on with sponge daubers. Witches Boot Holder Inspiration Sheet >Includes all supplies used. I would like an update on all the tutorial videos. I just cut some stockings out tonight and made little banners with them, they to turned out adorable, but your idea if fantastic! LOVE IT!!! Awesome tutorial…There are so many possibilities with this Bigz die cut…can’t wait to get it in my order. So very cute! I love the shimmer mist.